Have you ever had a situation where you've just got to match a font, but you can't for the life of you find a good match? You've used Find My Font and other online tools to try to find a font that conforms, but nothing's quite right. Type Light, a freeware typeface editor and creator, could be your new best friend. Type Light works much like more advanced (and more expensive) Type 3.2, just with limited functionality. If the font's license allows editing, you can use Type Light v3.2 to open any of your existing fonts and edit them by using the Select Tool to manipulate the existing nodes. You can't add nodes to the glyph outline, but you can use Type Light's three curve manipulation tools (Corner Curve, Straight Curve, and Smooth Curve) to adapt and edit your glyph. You can also use the Curve Tools—plus a Line, Rectangle, and Ellipse—to design glyphs from scratch. It takes a little while to distinguish the important differences between the Curve tools and get a hang of drawing with them, so expect to take some time creating drafts. Fortunately, Type Light's included PDF manual offers helpful hints to avoid common mistakes. Most font creators and editors—including Type Light and its more expensive sibling, Type 3.2 ($65), and FontCreator Home Edition ($99, a personal-use font editor and design program)—use the TrueType convention that the filled area of the glyph is always on the right-hand side of the contour. This means that the outside edge of the glyph has to be drawn in Type Light clockwise, and the inside edge counterclockwise. Fortunately, Type Light includes an easy-to-find reverse contour command, plus you can toggle preview shading on and off to help you draw correctly the first time. Even with these tools to help you, don't expect Type Light to create your font glyph for you.There are few shortcuts and no fancy tricks to help out. Type Light omits some of the most useful features found in Type 3.2. For example, you can't import and trace vector graphics, nor can you display a vector graphic as a background image to trace. You can't cut and paste a glyph, so you can't base one letter off another (like lower case n and h, for example); and you can't copy glyphs between fonts. Also, make sure you save frequent drafts, since you can only undo up to ten times with Type Light. Fortunately CR8 Software provides a chart for you to compare all of the features of Type Light and Type 3.2. As you become more of an expert with fonts, you'll need $65 Type 3.2, FontCreator Home Edition, or a similar program. 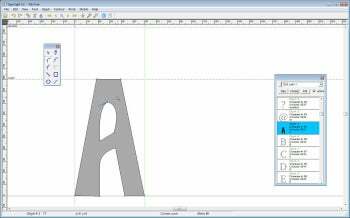 Only a professional tool will offer the more advanced drawing tools and address the need to tweak kerning, add ligatures, or make composite glyphs, or even play with gray-scale rendering hinting. But for someone on a tight budget, or who needs just one bespoke font, Type Light will probably do the trick, and won't take a great deal of time to learn. Plus, if you decide you need the advanced tools offered in Type 3.2, Type Light works the same and is a great demonstration of the ease and power of the Type family of programs, so you haven't wasted any time … or money. Design, edit, and convert OpenType, TrueType, and PostScript fonts, with Type Light (and a few limitations).